The OTC market is hot right now, and we are ready to deliver another sub-penny winner. 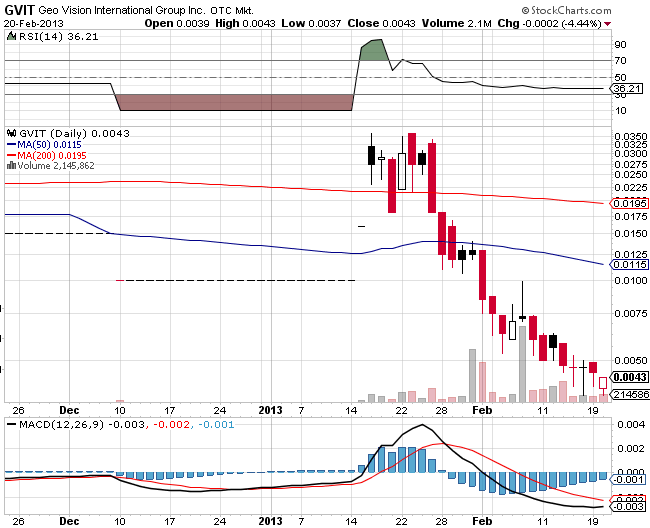 We have a huge Bottom Bounce Alert on Geo Vision International Group, Inc (GVIT) today. GVIT has pulled back in a big way over the past month, closing yesterday at $0.0043, after reaching highs of $0.035 just a few weeks ago. Best of all, GVIT has been very quiet of late, and we think the chart is set up beautifully for a big move off the bottom here. We particularly love the technical's on this one. The RSI at 36 is showing very oversold conditions, and the MACD is bullish. Better still, the chart is showing a slowing downward momentum and is starting to consolidate at current levels (as evidenced by the long tails on the recent daily candles), with weeks of selling pressure at an end. With sellers out of the way, buyer momentum could propel GVIT to nice gains today. Recently, GVIT received approval to have their products sold on Sears.com - a very popular online shopping destination owned by major department store retailer, Sears (NASDAQ: SHLD). This could lead to big revenue growth and a lot of exposure. GVIT is dedicated to offering health conscious Boomers safe and natural products at affordable prices. Their mission is to provide effective supplements to not just maintain but improve health and well-being, supplying only the finest quality nutritional and dietary supplements at a high value. In addition, GVIT's supply chains are closely monitored and meet the highest FDA standards. We think GVIT could take off today, so make sure you are prepared at the opening bell. We'll keep you informed of any updates throughout the day. Pennystocksgonewild.com may receive compensation and its employees and affiliates may own stock that they have purchased in the open market either prior, during, or after the release of the companies profile which is an inherent conflict of interest in Pennystocksgonewild.com statements and opinions and such statements and opinions cannot be considered independent. Pennystocksgonewild.com and its management may benefit from any increase in the share price of the profiled companies and hold the right to sell the shares bought at any given time including shortly after the release of the companies profile. PSGW has received two thousand dollars from a third party, MicroCap Innovations, LLC for this one day profile of GVIT.